Tag this correctly, maybe you’ll be able to see it. Yet another mutant mine game. There’s nothing different from a normal one, except the boundaries keep getting shrinked during playing, and you can detonate the mine. Sorry for not giving explaination. The gameplay is actually quite different from old minegame. In fact, you don’t have to find out all mines. 1. left Click to open tile. If it’s a mine, it explodes and hurt your HP. 2. right Click to MARK/UnMark known mines. You can also Drag with Right Mouse Button to mark tiles continously. Marker number is limited. When you mark some tile, your marker number decreases. When you unmark, it will recover. * The right marked mine will explode without hurting you. * The wrong marked mine will explode and hurt you. *If there is no wrong mark, your marker number will get recovered plus some bonus. 4. When all mines get cleared or marked, you win. 5. When there’s no empty tile remaining, you lose. 7. Mines which is in shrinked tile will try to move inside. But if it’s marked it will explode (marker will not recover). Good luck, Good morning, and Good night to everyone. The forces of light have killed your master, you have to go to the inner Sanctum to revive him! EDIT: This post was made on time. It would have been up sooner but I’m new to the word press system, and didn’t realize you have to hit “Publish” Instead of just save. I have Squeezemaze up on scratch’s site. It’s a java applet that runs it (technically the java applet runs a squeak interpreter) so I think windows, linux and Mac can play that version of it. Update: For anyone who isn’t judging for the compo, you should get the patched version here with better performance and fixed collision edges. Windows If you get a “This application has failed to start …” error, you need to install vcredist_x86.exe. Aliens have invaded and are exterminating the humans! Their massive deathbeam is tearing across the world, destroying everything human. It’s up to you to save them. You are the white dot, and you have a jet pack. Use left-arrow and right-arrow to walk, spacebar to jump. Grab the other colored pixels and take them to the rescue teleporters to send them to safety. The more people you deliver in one teleport, the more points you get. Some humans are worth more than others! Getting hit by the beam will kill you and other humans. Your suit protects you against the turret fire, but the civilians aren’t so lucky. to start playing, click into the game window, then use then left, right, space, escape keys. to jump higher, you have to wait. just rest on a platform till the blue bar on top charched up enough. 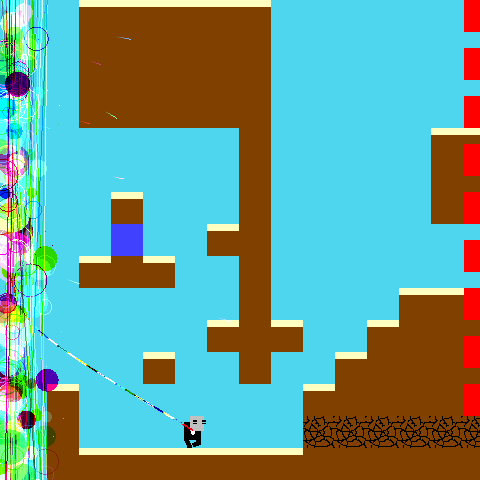 the levels are badly randomized, and not properly tuned yet. so if you got stuck: choosing menu > new game might help. If you know what Löve is, and have it installed already, just grab arcticum.love and run it. Each package contains instructions on how to run the game, and the following Readme. Enjoy! Game resolution is 1024×600. It might show up weirdly (strech for instance) on 4:3 screens. Press F on title screen to switch to window mode, much nicer. The sources of the game are in the .love file, which is really a renamed zip. Sorry it’s about 20 minutes late, I had a last minute problem with my release build. It’s still really incomplete, so it’s not like I’m going to win anything anyways. Here it is.. in all it’s horrible incompleteness. The idea is to save the mammoths from the oncoming glacier by placing ice blocks (tetris pieces) ..
It’s completely horrible and it’s not actually possible to beat it, but at least I got something made! I finished it before the deadline, as the members of #ludumdare (or their chat logs) will attest. Left and right to move, up to swap left and right (I probably should have left that one out), down to go into reverse. Edit: It’s a lot easier if you use F5 to save and F6 to load! It’s possible to make it to the tip of the black/grey line, but not to get onto the second set of dots. But you can win if you press O! Clarification edit: The dark grey lines are the floor and the light grey background is an infinite void hole. As long as some part of you is touching the dark grey, you won’t fall into the hole. Unfortunately, I made the level in the very last two minutes of the compo, so I didn’t have time to test it; the result is that the level is impossible, and most of it is extremely hard. If you want to find some enjoyment in the game, try getting onto the first dot; that’s actually a reasonable challenge. As it is, this game mostly functions as a demo of the controls. This was my first time coding in flash and I think it went alright considering. I could really have used another hour or five to add polish and improve the AI. Warning: My splash screen won’t load and neither will my win/lose screens, hence the missing image thing on the main menu. Cest la vie. Also ran out of time so no instructions or similar help is provided. Basically left and right arrow move you. Drinking nog extends the end of the wall doom cloud thing away from you, but makes you stagger all over the place. Drinking buzz increases your speed and the responsiveness of your controls. Running into the red egg-beaters (yeah didn’t get time to go over that piece of art) hurts you. You can lose by running into the doom cloud, falling over the side, and losing all your health. To win, get humpty home safely and into bed. Might post an update tomorrow night fixing the splash screens and any other minor bugs. Ok, so this isn’t even close to a finished game, so you don’t have to play it to know that. However, I might still be able to pull a medal out of the food compo, so I’m submitting. Edit: My comments to ratings are attached to this post. ‘wasd’ and ‘g’ to fire, ‘h’ to jump for player 1. Arrow keys, ‘m’ to jump, and comma to fire for player 2. 396 queries executed in 0.696 seconds.